If you have a voucher code you can redeem this on the Basket page. Simply enter your voucher code in to the Voucher Code box and click 'Apply'. 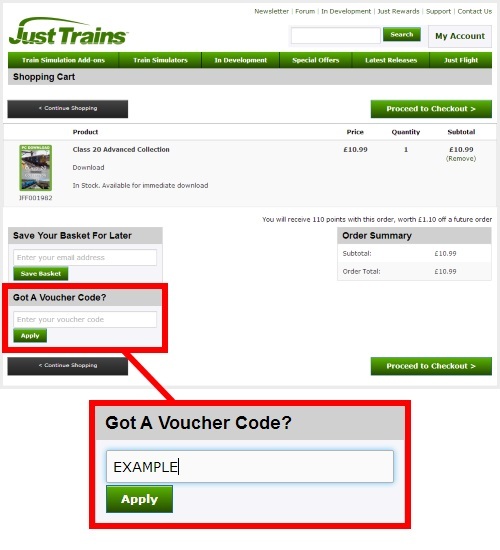 You will see a message at the top of the basket showing confirmation that the voucher has been applied successfully. Please check that the voucher code is typed correctly, with no spaces before or after the code. Also please check that the expiry date hasn't passed, and that you have the correct item(s) already placed in your basket - some vouchers require a minimum spend (basket value) or specific products for the voucher to qualify, depending on the specific voucher you are attempting to redeem. If you are still having trouble using the voucher/discount code, please submit one ticket and a dedicated member of our team will be able to assist you further within two working days.